Heard the news? 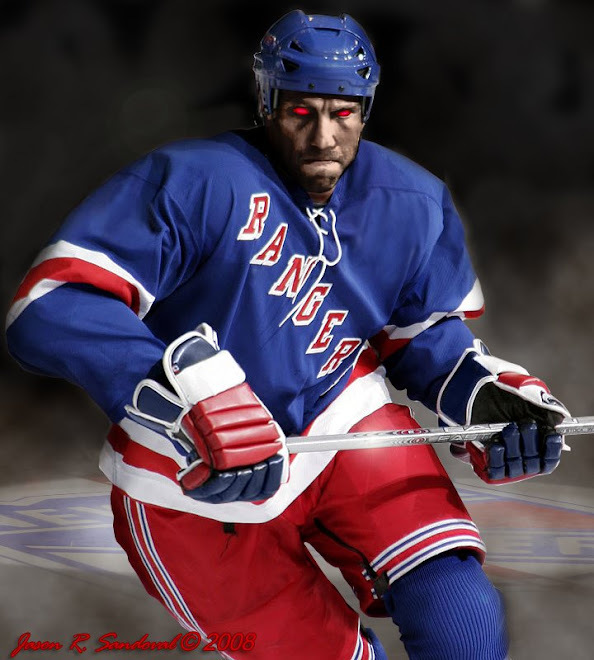 The New York Rangers 'had game' last night at The Igloo in Pittsburgh. With a smorgasbord of 'everything Canada' happening during the Vancouver opening Olympic ceremonies and Canada's very own Sidney Crosby scoring two goals, perhaps the Rangers win was a foreshadowing of Sweden's future gold medal over Canada in the Winter Games!!? NYR Goalkeeper Henrik Lundqvist - who serves as Sweden's amour-propre - was extraordinary. Two Olympic heroes battling for pride & country; a diving finesse player versus Ultra Man in goal. Blue country won last night. The Blueshirts' goals were sweet, the first at the beginning of the second period - a Chris Drury backhanded feed to a cycling Brandon Dubinsky. Goal one. The second a beautiful Anisomov feed to hardest-working-Ranger Vinny Prospal. The much deserved game-winning-goal in overtime, a gift from newbie Ranger Olli 'Twist' Jokinen -- who played well throughout and earned the privilege of disappointing the Penguin faithful. So there.. Igloo poo...we won our final Igloo game f*ckers! There were plenty of Ranger-post-shots (tilts) in the second period, so the score could have been dramatically different if some of them went in, but it is reassuring that our forwards are, at the very least, now aiming for the net. Boy, the Penguins are damn good, but we beat 'em. I cannot say the Rangers were the better team last night, but there were moments when they controlled the tempo, got in on the forecheck, battled hard and, unquestionably, had the better goalie. Recently thigh-injured Marian Gaborik opened the game but after four minutes left the game unable to continue. Shortly after "big mouth sit-on-that-side-of-the-bench Torts whipping boy" Michael Del Zotto sustained an injury to his abdomen -- also a significant laceration, as later reported. So even without our only consistent goal-scoring now injured Wild-wonder and our playing-better-hockey-19-year-old removed from the game, we rose to the occasion and stepped up our play for the win. Did Chris Drury actually drop his gloves and fight Cooke last night? I must have been dreaming. Did Gilroy and Anisomov throw themselves to defend cheap shots on our goalie? This isn't my team!!? Did they commit less than 2 penalties? The Rangers? Momma Torts must have had a talkin' with our boys because this was a very different level of game. It had discipline. They left some beating heart on the ice and walked away with a girlfriend - a win. I only wish that Brandon Dubinsky charged Sidney Crosby right after the second period. With Brandon being held back by an official on ice, Crosby leaned over and tapped Dubie's stick as a challenge (mind you, while being held back by Bettman's black-&-white stripemen). 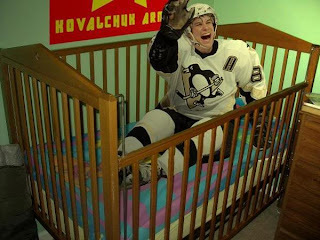 I do love that Dubie was quoted as saying "Not sure what was wrong with Sidney, but he is such a baby sometimes out there..." We love you Dubinsky....speaking our language. " 5-hole posts the videos here. The Blueshirts currently reside in 11th place in the Eastern Conference, only one win away from the final eighth slot. With over 20 games left, there are eight teams that will be battling for the final three slots of playoff qualification -- we need to be greater than a .500 team, winning at least 12 to 15 of the next 20+ games. Possible? Probably not. But there is hope & desire. If they can play every other game like they played against Pittsburgh, we can look forward to that eighth slot. And do we even want that last slot? Still in shock here. A win. A win? Uh huh. A WIN! Say it over & over & over and it might just come true. Nice recap; interesting and entertaining game. Prospal, Dubinsky and Olli each scored their 13th goal of the season last night. Rangers won and it's good. It's extremely good considering many facts: absence of Gaborik and Del Zotto, terrible offense lately, non-existence of the "team". But.. may be it would make sense not to kill ourselves, play easy, get on of the last places in the league and get one of the first round picks? And since we have no chance to pass even first round of playoffs (if we'll have a chance to play in the 1stround) the idea of losing the rest of the season is not that bad..